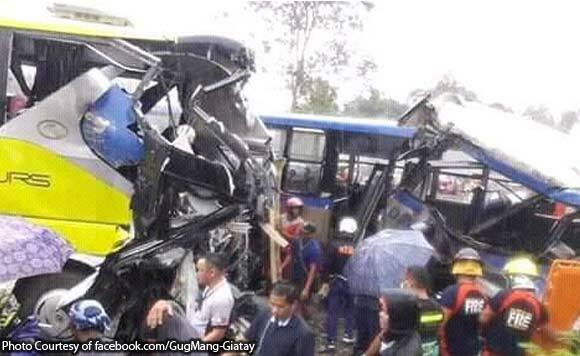 DAVAO CITY — Five persons died and 24 others were injured when two buses collided along Km. 92 in Barangay Magsaysay, Nabunturan, Compostela Valley province on Monday afternoon. Senior Supt. Arnie Palomo, provincial police director, identified some of the fatalities as Elsa Salarda Acedilla, 59, a resident of Montevista, Compostela Valley; Jerome Uyanguren of Veruela, Agusan del Sur; and Hamber Khen Despi, the bus driver of Metro Shuttle. Palomo said 13 of the injured passengers were taken to the Compostela Valley Public Hospital in Montevista; one in Nabunturan Doctor’s Hospital; and 10 at the Davao Regional Hospital in Tagum City. He said the incident happened when the Metro Shuttle bus driven by Despi swerved to the lane of the oncoming Bachelor Bus driven by Cruz Daig after the front tire of Despi’s shuttle bus ruptured.